The Quincy Club is the educational program of the John Adams Institute, which strives to help young audiences better understand American history and culture. It is named after John Quincy Adams, the son of John Adams and the sixth president of the US. 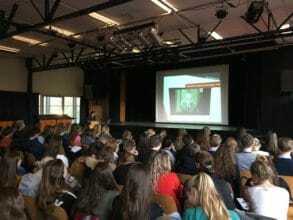 Since 2002, it has organized fourteen lecture tours, in which a speaker gives a series of guest lectures at high schools all over the Netherlands. Previous lecture series have been taught by Americanist Frans Verhagen and anthropologist Maria Reinders-Karg, on topics such as the history of Dutch-American relations, the history of American immigration and integration, and slavery in all its historical and modern manifestations. The lectures are offered to the participating high schools free of charge. They are intended, in the broadest sense, to enlighten Dutch high school students about American affairs in a non-partisan and informative fashion, and to engage them in a dialogue about their own perceptions of the USA. In the year 2016, the lecture program was given by Albertine Bloemendal, a professor in American Studies at the University of Leiden, on the subject of the presidential elections. This year (2017), the subject was the Marshall Plan which is an essential element to the reconstruction of post-world war II Europe. On June 5, 2017, it was exactly 70 years ago that US Secretary of State, George Marshall, gave his famous speech in which he announced that the US would extend a helping hand to war-ravaged Europe in the form of the European Recovery Program, better known as the Marshall Plan. This anniversary offered a great opportunity to draw attention to – and to draw inspiration from – the most successful international aid program ever. With reason it is described in history books as ‘The Most Noble Adventure’ and ‘An Act Without Peer’. Images of war, devastation and displacement pour into our living rooms almost daily, but for most Dutch people they feel far away. In an era of long-lasting peace and great prosperity, it is easy to forget that Western Europe itself was in ruins a century ago, devastated by the horrors of World War II and with a great shortage of the resources needed to rebuild the continent. The images that were seen in American newspapers at that time were not about refugees from Syria or about hunger in Africa, but about us: Europeans. The hope was that the European countries would not take up arms again, but would learn to cooperate in the service of higher, shared values ​​and interests. The Marshall Plan also had to make Western Europe strong and resilient in the context of rising tensions between the West and the Soviet Union. In this context, America would not only provide economic assistance, but also take care of Western European security. It is not only important to reflect on the fact that peace and prosperity are not self-evident; the contribution that the Marshall Plan made here 70 years ago can still serve as inspiration for policymakers in search of fundamental solutions to thorny international problems with a long-term perspective. For example, Al Gore called for a ‘Global Marshall Plan’ to address the climate issue, and former British Prime Minister Gordon Brown stated that only an initiative as ambitious as the Marshall Plan could offer a solution to the Syrian refugee crisis. German Chancellor Angela Merkel is still inspired by the success story of the European Recovery Program: in 2017 she proposed a European Marshall Plan for the African continent. This year, 44 high schools signed up for the Quincy Club lecture series. The John Adams Institute made a selection of 20 schools based on previous participation and geographical proximity to another high school. We tried to arrange it so that there was one lecture in the morning and another in the afternoon. For each lecture, there was a minimum of 60 students, although the groups were usually bigger. This means that roughly 1500 students were reached. The target group was 5 Havo and 5 and 6 VWO, the two highest forms of Dutch secondary education. The students were between 16 and 18 years old. Thanks to the extensive database built up by the John Adams Institute, it was relatively easy to contact the schools. This contact usually takes the form of an email stating what the theme of the year is, who will give the lecture and when schools can register. 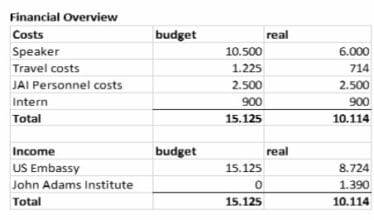 Many schools that apply explained that the Marshall Plan is part of this year’s final exam. However, some schools did not want to host the Quincy Club lecture until the subject had been dealt with in their history classes. As a result, some schools who had registered ultimately did not want to do the lecture on the dates available. Those schools were replaced by others, so we still reached 20 schools. The lectures of Albertine Bloemendal were very clever and fun. Interested students have gained a lot of new knowledge. Albertine used a few brilliant tools to hold their attention and keep the presentation interesting. She used a combination of historical context, news and historical film reels and an anecdote about the interaction between our Prime Minister and the American delegation. She drew the audience out by asking them questions and asking for their possible future interpretations of a Marshall plan for other parts of the world. 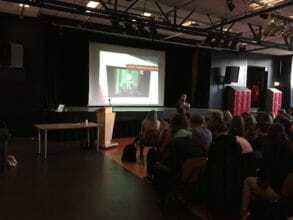 The presentation contained several elements that were new for the students. Even for a non-high school student, it was a fascinating but not overly simplistic presentation. Many people would make the subject less extensive to keep it more apparent. This was not the case with Albertine’s presentation. Her use of the aforementioned tools made it unnecessary to simplify the information she passed on. In addition, Albertine is also a very good presenter. Her voice is pleasant to listen to, and she keeps a fast but pleasant pace. All this is kept together by a well-crafted PowerPoint presentation. That presentation itself was clearly a lot of work. It was both readable and aesthetically pleasing to watch. The Quincy Club is not only an outstanding initiative, but also very helpful to high school students. It is terrific that the John Adams Institute participates in the transfer of knowledge. As a student, I would have been very happy if I had had the chance to engage in such a lecture. It also gives excellent insight into how a slightly more academic style of teaching feels in contrast to a more school-like way. For the future I would like to suggest a few changes. I would recommend using a google calendar or the planning website Doodle (www.doodle.com ). This creates a direct overview and could be used by schools to see which days and times are still free. This software is free and also allows you to add times or days later or change it when necessary. This makes it easier to organize the lectures by geographical region. All in all, the experience was fun and instructive and a great project to take part in.